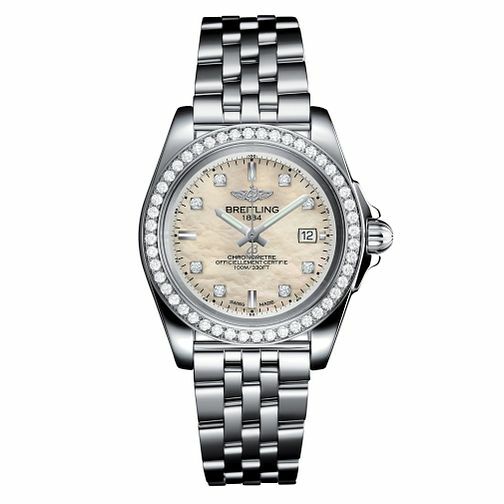 Breitling presents a distinctive ladies' watch with a classy take on a great sports timepiece. It combines style with performance with a Steel, Diamond-set bezel in tungsten carbide, an ultra-hard, scratch-resistant high-tech material and diamond hour-markers. In a steel case with natural mother of pearl dial and Pilot steel bracelet. The sturdy case water-resistant to 100 m (330 ft) houses a Super Quartz movement ten times more precise than standard quartz.